Great news for all job seekers. 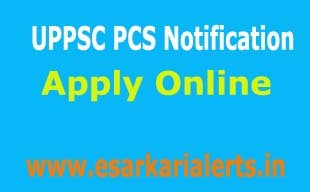 Recently, the UPPSC PCS Notification 2017 is released by the Uttar Pradesh Public Service Commission. Under this process, the organization will fill up the 251 vacancies of Regional Transport Officer, Assistant Commissioner (Commercial Tax), District Commandant Home guards and many others. For this the commission will conduct an examination which is named as Combined State / Upper Subordinate Services Examination 2017. So, the candidates who are attracted towards in this job notification then you may grab this opportunity by submitting your online application form before the closing date of applying which is mentioned underneath on this page. Let’s check the important details of UP PCS Notification 2017. The UPPSC is also identified as Uttar Pradesh Public Service Commission. The commission chiefly works for the recruitment of suitable applicants on different vacancies in various government certified departments of Uttar Pradesh. Now, the organization will recruit the eligible aspirants on described positions and eligible and interested contenders need to submit the UPPSC PCS Online Application Form using the easy ways which are furnished below on this page. Academic Eligibility: Dear candidates, if you want to apply for this notification then you must possess a Bachelor’s Degree from any recognized university or its equivalent qualification. Moreover, as per the official notification there are some additional qualifications are required for different posts. So, the contenders need to check that in the official advertisement. Age Limitation: Here we would like to inform our viewers that the minimum age limits for this notification is 21 years and the maximum age limit is 40 years. The age of applicants will be counted as on 01-July-2017. As well as, the relaxation in upper age limit will be applicable for all reserved category contenders as per the official standards. The applicants will be assorted according to their performance in following rounds. The pay scale for these posts is Rs. 9300 – Rs. 34800 Grade Pay Rs. 4200 to Rs. 15600 – Rs. 39100 Grade Pay Rs. 5400. To interested and eligible candidates can apply through the online mode only. The runners who want to participate in this recruitment process they will have to submit an online application form on the organizational website which is “uppsc.up.nic.in”. On the homepage of authorized site, the contenders have to click on this notification link and then fill out the online application form in a correct ways. After that, upload the documents which are described in the official notification. After the filling of application form, the aspirants have to make the payment of application fee via suitable mode. Finally, submit your application form and don’t forget to take a printout of it for the future use. So, the discussion on the subject of UPPSC PCS Notification 2017 ends here. We expect that the contender will be satisfied after considering these details. The candidates who have any query relating to this subject they must put that in the comment box of this page.